Intel has been focused on the tablet and mobile market in an effort to regain market share from ARM. Higher performance at lower power consumption has been the key differentiator to extending battery life and winning designs in most consumer devices. This also extends into the commercial / enterprise applications such as microservers, data storage and network traffic management installations. 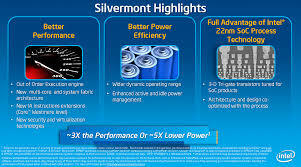 The most recent device in the Atom family of processors, called “Silvermont“, has begun shipping. Built on their 22 nm fabrication technology, Intel has been able to significantly increase battery operation time by eliminating parasitic and leakage currents on the chip. They have coupled this with innovative circuit design and embedded power management features, which gives them a distinct advantage over their competitors, AMD and ARM. Intel’s upcoming mobile chips based on the Silvermont are better at power and performance than ARM’s fastest Cortex-A15 chips. Cortex-A15 is not even close to Silvermont. They are higher power and much behind us on performance which means they are on the wrong scale. Also in the news for Intel, at a recent San Francisco conference they unveiled what they are calling “the first operational Intel Rack Scale Architecture (RSA)-based rack with Intel Silicon Photonics Technology”. This is a new switching and routing fabric for data centers which utilizes a new MXC connector and “ClearCurve” optical fiber from Corning. The combination of high performance, low power processors with advancements in their proprietary optical switching technology is giving Intel a leadership edge in the highly competitive data center market. Many companies, like Google and Facebook, are developing their own hardware solutions to their data storage and server needs; Intel’s latest offerings provide a suitable alternative to the question of build-your-own versus buy from a third party.